24th March 2011, Wesley Study Center, Cranmer Hall, St Johns, Durham. Methodist Preaching Service. Preacher:Andrew Stobart. This was a tough one. There were so many ideas in the sermon, so many possibilities but I think I caught the essence of the sermon with this image. Like the text there are a number of layers here. First the idea of Lent is one of preparing, of self examination and anticipation of salvation. You catch a sense of that in the text too. The perspective of the picture is looking through the key-hole at the cross as though we are just waiting for the key to turn in the lock and suddenly salvation will be upon us. The key-hole restricts our view of the scene beyond. There is a sense that the Apostle Paul has glimpsed something, an amazing revelation that in Christ the long hoped for salvation of the Jews has found its fulfillment and yet it is not fully disclosed, there is something of a mystery about it. But ‘Hope’ is the key-hole in the midst of our suffering through which we glimpse the salvation that is to come. 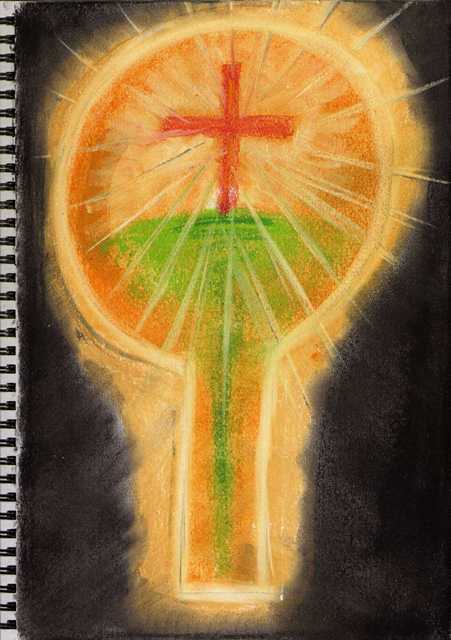 Then there is the obvious idea that the Cross is the key that unlocks salvation and opens the way to eternal life.